People have been making wine for centuries, and today, home wine making is still a popular hobby. The basic process of making your own wine is quite simple, and you can also buy kits to make things even easier. People have been turning fruit juice into wine for thousands of years. In the Middle Ages, the alcohol content in wine made it a safer beverage than water, so many families drank wine with every meal. It was also an essential part of many religious services. Today, the wine industry is important to the economy of many countries, including France, Chili, Australia, Germany, and the United States. 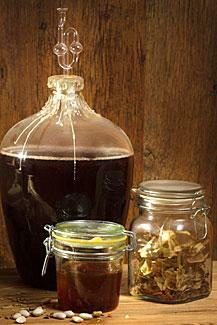 In recent years, many people have discovered the fun hobby of making their own wine at home. You can make your own wine from grapes and other fruits like apples, cherries, peaches, plums, and strawberries. You can buy these fruits in pre-made mash or juice form from a wine or beer making supply shop, or you can juice them yourself. If you're new to making wine, start with a kit from the wine shop. Midwest Supplies has a huge variety of wine kits, and lots of equipment. Homebrewer's Outpost is a good resource for everything from basic starter kits to specialized ingredients. E.C. Kraus offers wine kits for every level of wine making, whether you're using your fruit or theirs. Fine Vine Wines has lots of ingredient and starter kits and also runs monthly specials. Seven-gallon or larger lidded container: This is used for primary fermenting. The container can be as simple as a plastic bucket with a tight-fitting lid. Air lock:This is a valve that fits into a hole in the top of the primary fermenting container. It allows gasses to escape and prevents the lid from unsealing from the container. Spoon: The spoon should be made of plastic and should have a handle that is long enough to reach to the bottom of your primary fermenting bucket. Six-gallon or larger glass container: You'll use this for secondary fermenting of the wine. 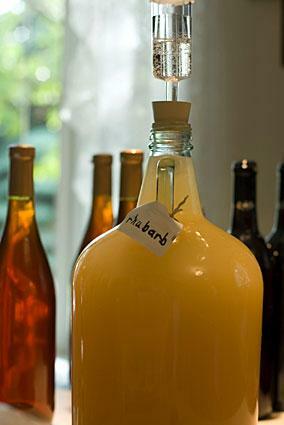 Many people find that a large bottle, called a carboy, works very well for this purpose. Bung: This is a rubber stopper that fits into the neck of the secondary fermenter. It has a hole in it to accommodate the air lock. Hose and clip: You'll need a long, thin plastic tube to siphon the wine from the primary fermenting bucket to the secondary fermenter. A clip helps to hold it in place. Hydrometer: This device lets you test the specific gravity of the wine to determine whether it has the appropriate alcohol content. Sanitizer: You'll need a food-safe sanitizing product to ensure there are no contaminants in your wine, equipment, or bottles. Wine bottles and corks: If you are making a standard five-gallon wine batch, you will need about two dozen wine bottles. Wine corker: This device pushes the cork into the filled wine bottle. There are several different styles, but a good beginning option is an affordable, hand-held model. When you've assembled all your tools and ingredients, you're ready to start making your own wine. The process typically takes about six months from start to finish, but most of the work is done at the beginning. Sanitize all of your wine making equipment. This is a very important step, since it kills any bacteria or yeast that could be harmful or affect the flavor of your wine. Add the juice and water to get six gallons of liquid. If you're new to wine making, follow the instructions on an ingredient kit from your favorite wine store. If you have some experience, experiment with wine recipes to find a variety you especially like. Keep the juice mixture between 65 and 75 degrees Fahrenheit during the mixing process. Check the specific gravity of the juice mixture using your hydrometer. Keep stirring the mixture and waiting until the specific gravity measures above 1080. Next, add the yeast. This comes as part of a wine making kit, or you can purchase it separately. Tightly fit the lid to the primary fermenter, and store it in a place that is above 70 degrees and below 80 degrees. The liquid will begin fermenting. Check the specific gravity again every four days. Allow the juice to ferment until it reaches a specific gravity of less than 1.000. Typically, this will take between 12 and 16 days. When the wine has fermented, you can transfer it to the carboy for secondary fermenting. Follow the instructions on your wine kit, which will usually have you add sulfites, preservatives, and clearing agents during this step. Use the siphon to transfer the wine to the carboy, and add enough water to fill the bottle. Then insert the bung and airlock. After two weeks, you can transfer the wine back to the primary fermenter and discard the sediment that has cleared out. Transfer the wine back to the carboy, and wait two more weeks. Sterilize your wine bottles, and fill them with wine. Use the corker to insert corks into the bottles. 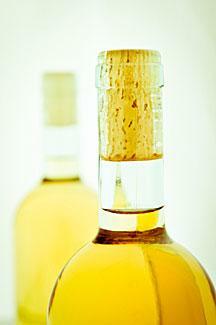 Keep the bottles standing upright for at least two or three days to allow the corks to expand. Store the wine bottles on their sides, and allow the wine to age for the amount of time specified on your kit or recipe. Typically, this will be a period of a few months. Food.com has a tried and true recipe for a basic grape wine. This is a good place to start if you're a beginner. Grandma's Best Homemade Wine has wine recipes and instructions for several different types of wine. How to Make Fruit Wine includes a basic recipe for blackberry wine. If you're interested in experimenting with fruits besides grapes, give this a try. If your wine has an "off" taste, it may have to do with contamination from wild yeast or bacteria. Be sure to clean your equipment very well before you begin the process. For beginners, it's a good idea to start with a kit, rather than follow a recipe or experiment on your own. That way, you can learn the process without too many variables. There's a lot involved in this process, and it's important to follow the directions carefully and wait the specified period of time before sampling your wine. Expect a few imperfect batches of wine before you become a master wine maker. The more wine you make, the better your wine will be. Try your wine multiple times. If it isn't as good as you'd hoped, it may need to age a bit longer. You never know what a few more weeks will do. Many wine makers report that the hardest part of the wine making process is waiting for the wine to age. However, the rewards far outweigh the patience and hard work. In a matter of a few months, you'll have two dozen bottles of your own homemade wine to give to friends and enjoy at home.